Wow! wonderful St. Agnes.......it could be nice if the final settings be pronounced from Sigbin and then you can put it in your Tarp..if we only know how many participants will be there then we could print it in T-shirts...that is my idea. What you think? Have you got my email? Were you able to contact Sigbin? I'll be making some samples tomorrow labon wala pami class (actually, nahan ko mag layout-layout man, so enjoy rapod ko...)..
mo palit ko ug t shirt ha? 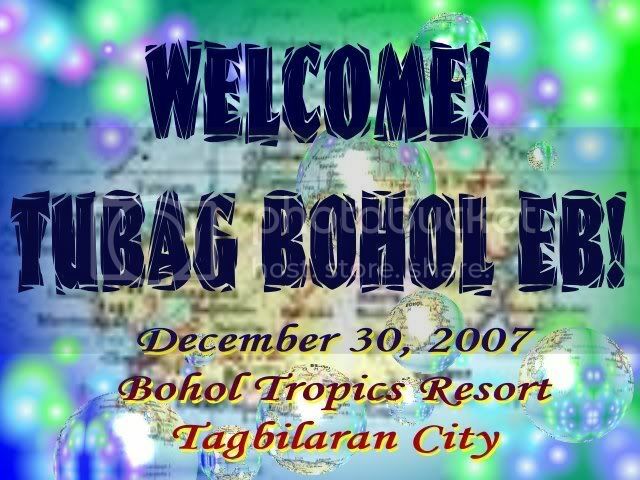 How about making it "Welcome, Tubag Bohol December or Christmas EB 2007"
wow nice ang design.. pwedi.. order ko daan kay maunhan ko ni ginger..
Barbs, palite ko t-shirt ha? ikaw bayad ha? Bisan dili ko kaapil,gahini ko ug usa ha? I like this one....it looks very nice...I think you can let it print in T-shirts. It seems that lot of our members like to order. What do you think? Is this possible? You can make an example ..that if you have enough time, verify the value of the T-shirt plus the prize to print it (Back or frontside).